More effective locomotion on compliant substrates can be achieved by modifying leg design properties (shape, stiffness) as well as gaits (coordination patterns between legs). 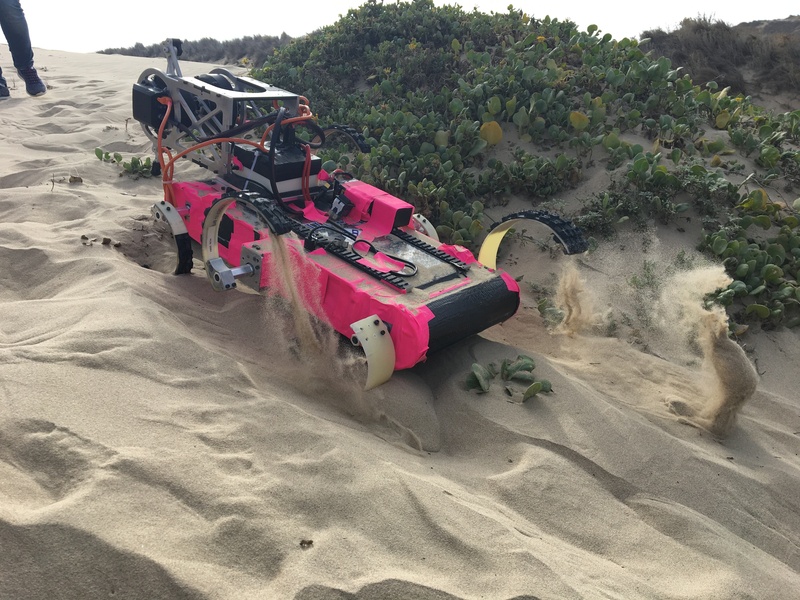 Transitional behaviors (specialized turns, jumps) can also improve performance by enabling the robot to avoid or jump over “obstacles” such as areas of a dune that are too soft or too steep; transition between two terrains; or regain control of a robot by resetting its position or orientation. 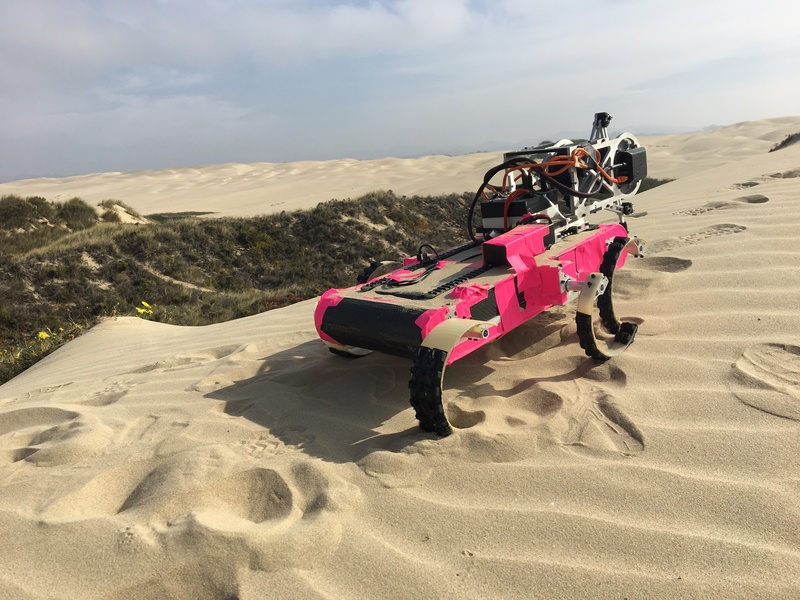 Above: RHex carries a shear strength sensor up a dune slope with very loose sand in Oceano Dunes, 2016. Researchers at other institutes (e.g. Dan Goldman’s group at GA Tech and Tonia Hsieh’s group at Temple University) create models describing the physics — mechanics and dynamics — of animals and robots locomoting through a diverse range of compliant substrates. We attempt to harness these models to create robot controllers robust to a poorly modeled, compliant world. Above: Google auto-generated a video collage of locomotion experiments with RHex at our new location, PERCH. 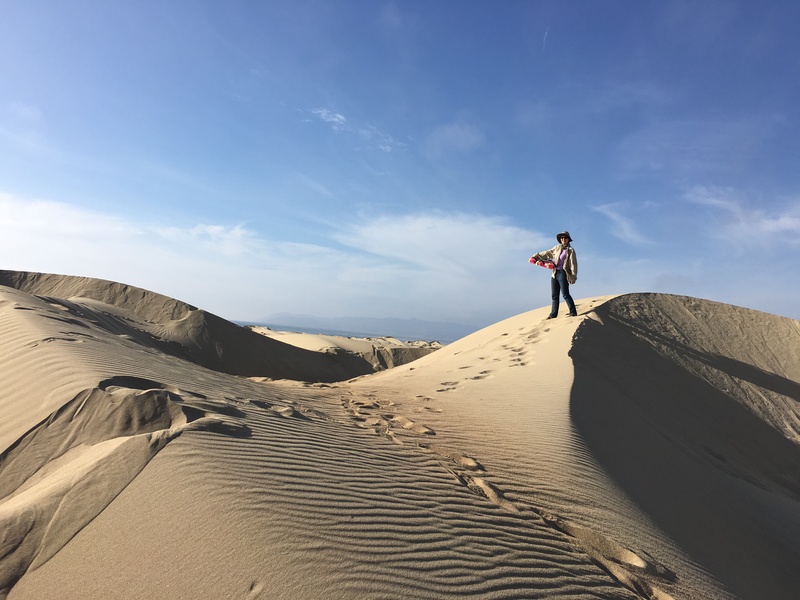 Below: RHex walks up a dune slope with compact sand at Oceano in 2016. Most of the world is not paved, but most research on locomotion assumes a rigid surface. For example, search-and-rescue operations will almost never take place in rigid environments — either because there is a debris flow, or because the rescue is in wilderness — and extraterrestrial exploration is certainly not going to involve nice roads and staircases. “Legged Locomotion for Desert Research” develops methods for the kind of research that scientists might like to do on other planets right here on earth by taking robots laden with sensor packages to inhospitable deserts, creating little “laboratories on legs” that can produce data with a high spatial and temporal resolution. Traditional methods for conducting geoscientific research produce only good spatial or temporal resolution, but scientists are able to compensate by conducting repeat or higher resolution experiments over multiple trips, provided of course that the scientists can anticipate which experiments require repeating. Increasing the resolution of data during one trip will enable scientists to create massive datasets which can be used for groundbreaking geoscientific research on Earth as well as potentially on other planets. Sonia Roberts uses a combination of physical experiments and computer simulations to develop controllers for robots to simply and robustly walk on granular substrates like sand, wood chips, etc. Sonia also provides support for the robots Kod*lab lends out to the scientists it collaborates with, including developing simple solutions to pressing locomotion problems (like widening the robot’s legs or switching to stronger gearboxes).